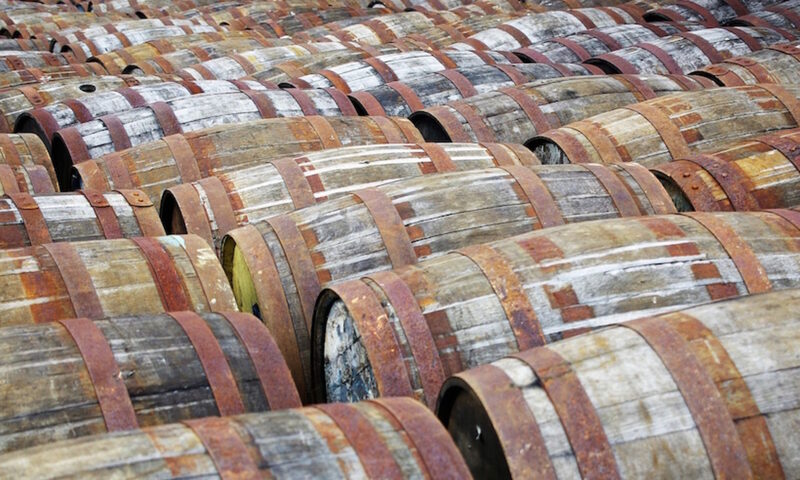 Firstly – what is grain whisky? It’s, from the SWA regulations, any whisky that’s made in a continuous still. That’s a little simplistic, but the simplification of the cateegories over the year has now prescribed that anything coming out of a non-pot still is grain whisky. On top of that, any whisky made using a mash that isn’t 100% malted barley is also grain. So, malt whisky made in a continuous still and a malt/wheat/maize mix made in a pot still are both grain whisky – the former much to the distress of distilleries like Loch Lomond who have been experimenting with what they make in their various different stills for years. Grain is generally distilled to a higher ABV (much closer to the 94.8% ‘the character of the raw materials is still detectable’ limit that stops it being vodka) and is thus generally a lighter spirit that relies more heavily on the flavours extracted from its cask than malt whisky. Anyway, the tasting. We were at the Squad home venue of the Gunmakers and we did things as usual, other than not having Jason present due to him playing away in Australia, wrapping up the bottles and tasting them blind. The first whisky had a nose of gold syrup and bitter wood, with a touch of egg custard and a baked bean meatiness underneath. To taste it was quite oily with toffee, sugar syrup, sweetcorn, butterscotch and some dark woody flavours. It finished short and sweet with a little bit of woody spice. This was revealed to be one of the two big company grains available on the market, and the one that’s drinkable – Cameron Brig. This bottle seemed a little off, with a bit more bitterness and some unexpected sulphur, with Cameron Brig fan (and Squad vet) Dave Haste rather dismayed that he disliked one of his usual favourites when tasted blind. He ‘selflessly’ tried some of his when he got home and reported that the bottle at the tasting was not as good, so Cameron Brig remains on cheap whisky recommendation list. The second whisky had a nose of wax and honey, milk chocolate, green ferns, jelly strawberries, cinnamon toast, solventy glue and a hint of menthol. To taste it had Crunchy Nut Cornflakes and Cadbury’s Caramel, combining to make an interesting Chocolate Cornflake cake vibe, lemon, crème brûlée and a little bit of the menthol from the nose. It finished with egg custard tarts and spicy wood. When the label came off this was no surprise – Compass Box Hedonism, the first whisky I wrote about on the blog. This is still a whisky that my opinion varies on, but on this night I was a bit of a fan. Whisky three had a fresh nose of cut grass, butterscotch and sweetcorn with hints of raisins and bitter tannins. To taste it had lots of brown sugar, bananas, spongecake and pastry (banana upside down cake tarte tatin?) with more grass and a sharp appley edge. It finished with lingering caramel and some fruity but drying apple skin. The label came off to show that this was Greenore 18, the older version of a dram I’ve tried a couple of times in the past. Unfortunately it’s recently received a massive price hike, generally thought to be connected to maker Cooley’s acquisition by Beam Inc and the predicted need for more aged grain stocks when Kilbeggan gets its inevitable kick into competing more heavily with Jameson. Whisky four had a nose of cooked pineapple, sponge cake, eccles cakes, brandied cherries, ginger, balsamic vinegar and orange peel, with a hint of green leaves/ferns. To taste it kicked off with brown sauce and Branston pickle before shifting through sour apples, green leaves and damp wood to sweet custard, sweet apples and a meatiness akin to beef crisps. It finished long, with damp wood and brûlée topping. The label was removed to show that this was a whisky from what I usually think of as my favourite grain distillery, the now closed Port Dundas – this was a 1973 vintage whisky from Duncan Taylor, bottled in December 2007 at 34 years old. I know this whisky rather well as I’ve tried to buy it in a few auctions in the vain hope that it might be a bit like the 32yo version we tried back in Whisky Squad #5. It’s not, but it’s worth a look if you can find a bottle. Whisky five started off with the traditional brown sugar syrupy nose of old grain with some spongecake and Crunchie bars before veering off through ferns into tarred paper, menthol and rich earth. To taste it had polished leather, baked apples, soft ground spice (coriander, nutmeg, allspice), a tingle of cinnamon, aniseed balls and liquorice root. It finished sweet, with stewed rhubarb and dark chocolate. This was a 1965 vintage whisky from Dumbarton bottled by Scott’s Selection. It’s one of the only available grain distilleries that I’ve not tried anything from and is unique in that it seems they use as close to a 100% maize based mash as they can (geeky point: you need some, generally about 5%, malt to provide enzymes that kick start the fermentation process, although you can add enzymes if you don’t want any malt. That might be illegal in Scotland though). The distillery was mothballed in 2002 and is now pretty much disassembled, as are many of the other grain distilleries, as the large companies that own them conglomerate their production into fewer locations. The final whisky of the night was one that I had been waiting for. On the nose there was airfix glue, ginger, Cinnamon Grahams, Kola Kubes, pineapple sweets, fizzy cola bottles, nutmeg, liquorice root and a malic green apple note. To taste it started off with brown sugar and gold syrup, with rich mahogany sawdust, syrup sponge, cinnamon toast, chocolate digestives and blowtorched banans. It finished with Crunchie Bars, juniper and pine sap. This is exactly the sort of grain whisky I like, with some more sappy woody notes as well as the rich caramel that they often pick up from the casks and it was what I was hoping – SMWS G5.2 – Strumming the Strings of the Soul. This is a 17yo whisky from Invergordon matured in a toasted virgin oak cask, rather than a cask that previously held anything else, making it more akin to a 17yo Scottish made bourbon. This was the whisky that I was hoping Phil would bring as it has come up many times in conversation between us since its release a year or so ago – Phil forced a glass into my hand, declared it one of the finest whiskies he’d ever tried and made me promise that I’d get a bottle. I nipped over from work the next day to find that it had sold out. Phil had bought the last bottles. Annoying though that may have been it’s nice to have been able to try it again and see that it wasn’t only my being drunk that made me think it was excellent. Ta muchly Mr Storry. Single Cask Single Grain Scotch Whisky, 65.3%. Was ~£50 but now very sold out.